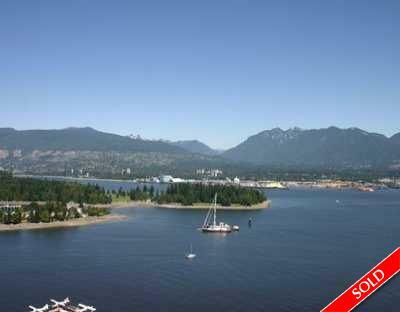 Description: Magnificent panoramic views of the ocean, Lions Gate bridge, Stanley Park & N. Shore Mountains. This luxury suite offers over 2,000 sq. ft. of living space with 2 bedrooms, a den & 2.5 bathrooms. Situated in the prestigious Shaw Tower located on the waterfront in Coal Harbour, the most exclusive neighbourhood that downtown Vancouver has to offer. Luxury finishes include 9 ft. ceilings, floor to ceiling windows, granite countertops & backsplash in the kitchen, subzero fridge & high end appliances, limestone & granite countertops in the bathrooms & electric fireplace. Spacious den adjacent to kitchen & an open balcony. This building has first class gym facilities & 24 hr concierge. Right on the waterfront, minutes away from Stanley Park & Robson St.